Sowohl die sehr eingängige, fast schon Arcade-mäßige Steuerung als auch das äußerst akkurat vermittelte Flugverhalten schlagen alle bisher erschienenen Konsolen-Flieger bei weitem. D.h. zwar nicht, daß die Flugzeuge leicht zu lenken sind, aber wenn man sich mit der Steuerung auseinander gesetzt hat, sind eventuelle Fehler nur beim Spieler selbst zu suchen. Das Beste an Aero Dancing ist aber zweifellos die gelungene Grafik, die keinen Vergleich mit High-End-PC-Simulationen scheuen muß. Die Flieger sind unglaublich realistisch gezeichnet und beeindrucken mit vielen Details und tollen Lichteffekten. Einzig die Bodentexturen hätten etwas detaillierter ausfallen können, was aber im eigentlichen Spiel kaum ins Auge fällt. The principle behind AeroWings is not to maim and destroy, but rather to truly gain a sense of respect for true pilots. AeroWings is designed for those who enjoy the sheer joy of flight. You are taught the basics of takeoff and landing procedures, and are later thrown into the thick of flying with other pilots attempting to hold your position while twisting and turning, in some cases within inches of your counterparts. If you are a true flight sim buff, and really didn’t want to buy a computer for realistic flight simulation, then this is definitely one you have been waiting for. Un bon jeu dans un genre atypique, mais qui risque d'en rebuter certains. Een uitdagende, uitgebreide stunt flightsim met mooie graphics en een goede besturing. Wellicht mis je af en toe het feit dat je niet even een raket of een 'smartbomb' op een gebouwtje kan droppen, maar als serieuze 'nononsense' flightsim is AeroWings absoluut geslaagd. I have always said when talking about Aero Wings, that if you truly dug Pilot Wings, this is a nice slant on that premise. You are however limited to fixed wing craft, and won't have the chance to pilot rocket jetpacks and all that kind of stuff. But if planes are your fascination, you will find tons of gameplay in this title. The controls are very good, even with the Dreamcast analog pad, and the visuals are certainly next generation quality. Casual gamers can fly for fun, while serious minded folks can work their way through tons of missions with progressively harder objectives. I would say that makes for a pretty well balanced game, and that is always a feather in a game developer's cap. Alle kampferprobten Air Combat Fans, die sich wieder auf Nachschub freuen, sollten ihre Begeisterung etwas zurückschrauben - kriegerische Handlungen sucht ihr vergeblich. Aerowings richtet sich an alle Pazifisten und bietet Simulation pur. Die Jets in der Luft zu halten ist ja kein großes Problem, ästhetische Figuren mittels eurer Rauchdüse in den Himmel zu schreiben oder sämtliche Ringe zu durchfliegen allerdings schon. Aerowings erwartet von euch viel Übung und Geduld, belohnt euch dafür aber mit wunderbaren Grafiken und Replays und einfach dem guten Gefühl, im Free Flight Modus tun zu können, was ihr wollt. Flugfeeling pur! If you’re always ready to spend an afternoon out watching the Thunderbirds or Blue Angels zoom by overhead then AeroWings is definitely your style of game. The aircraft visuals rival anything I’ve seen and while the game won't appeal to every player, those who want a more genuine flying experience will enjoy the thrill of high speed precision flight provided. Grafisch überrascht dieses Spiel mit einem sehr hohen Realitätsgrad, der sich in fast fotorealistischen Landstrichen widerspiegelt. Selbst der Brandung am Strand wurden einige Animationen spendiert. Auch das Fluggefühl überzeugt sofort. Mit wenigen Handgriffen hat man seinen Jet perfekt unter Kontrolle und führt waghalsige Manöver aus. Zieht ihr das Flugzeug nach einem Sturzflug schnell nach oben, wird euch in der Pilotenperspektive sogar schwarz vor den Augen. Plutôt sympa à jouer, Aero Wings propose une qualité de réalisation remarquable, surtout graphique. Malheureusement, on ne jouera pas trop longtemps... juste le temps de faire le tour des cartes. Il manque un certain dynamisme au jeu pour vraiment plaire au grand public. Mais si vous avez la passion en vous, vous pourrez reconnaître l'agrément de pilotage qu'apporte le jeu. 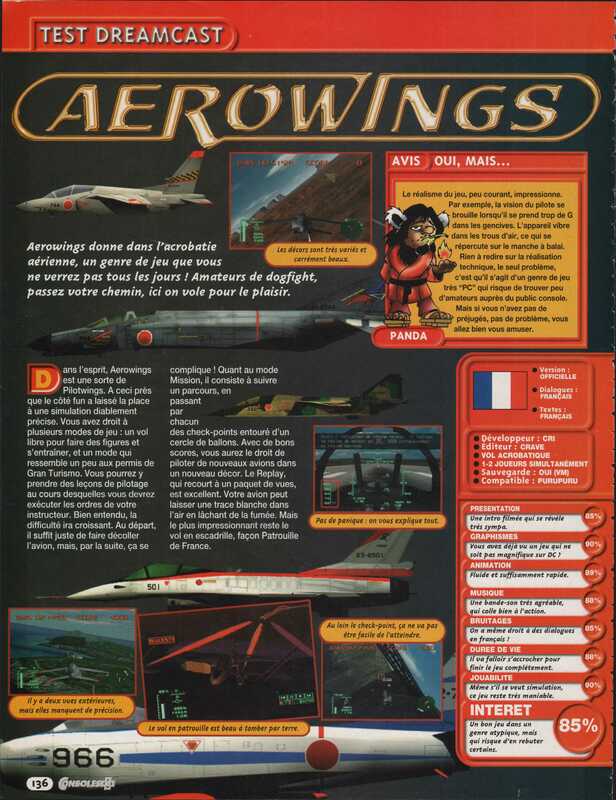 Complet, maniable et très bien pensé, Aerowings se positionne directemment comme la référence du genre sur console. If you've ever watched those Navy barrel rollers, the Blue Angels, and wondered what it would be like to pilot a jet fighter through a wide variety of acrobatic routines, Aero Wings just might be the game for you. Aero Wings could be considered a love-it-or-hate-it game for the system. Like Pilotwings for the Nintendo 64, Aero Wings is a quirky game in that it offers new avenues of gameplay in an unusual setting. I do recommend renting AeroWings; the concept is novel enough to be worth playing until it frustrates you. Living rooms with a plentiful budget should pick it up and support a pride building air demonstration squadron. Living rooms that, like Canada, find their resources pinched will want to consider spending their budget on more essential Dreamcast experiences. AeroWings sticks you in the hot seat with Blue Impulse, Japan's premier aerobatics squad who are pretty handy at the old game of flying. Closer to skating on ice than Top Gun, AeroWings relies on lush graphic and a deceptively simple concept of stunts, and not guns, to emphasise the difficult side of flying. Beautifully realised and very smooth - even with the screen full of planes - AeroWings is a joy to behold. The question of whether the style is matched by the content is more difficult to answer. While it's laudable that the game rewards flying rather than fighting skills, many will fail to see the point of a flight sim in which you can't engage your more aggressive tendencies. Ultimately this is the game's failing. At times it feels like half of it is missing, leaving too little for the more casual gamer to get into. No es un juego rompedor, pero al menos viene a llenar un hueco en un género que no es demasiado corriente en el mundo de las consolas. Grafiken är välgjord och realistisk, men bara så länge något av spelets 13 kameralägen visa flygplanen på hög höjd. Lite längre ned blir det nämligen pinsamt tydligt att spelmotorn inte riktigt orkar med. Byggnader och andra föremål dyker ofta upp från ingenstans och texturerna på marken ser orealistiskt platta ut. Men lyckligtvis är det ju i luften som allt det spektakulära händer - för den som har ett stort flygintresse och ännu större tålamod. Aerowings fait partie de ces jeux atypiques qui nous sortent de l'ambiance « cybernético-mickey-mouso-gore » qui règne dans les jeux vidéo. Voguer en escadron et effectuer des figures dans un ciel azuré, tels seront vos objectifs dans Aerowings. Bien sûr il s'agit de piloter des avions, mais le caractère pacifique des missions qui vous sont attribuées (même si les combats ne sont pas à exclure) contraste avec la production du genre qui privilégie les dogfights aux lances-missiles au plaisir d'un pilotage propre et cohérent. In the end, Aerowings made me want to put my controller down and turn off my Dreamcast after only a few minutes. It's refreshingly simple, but even that gets boring after a few minutes. Aerowing's graphics are pretty good. The planes look sharp and detailed, and the scenery on the ground looks photo-realistic (until you get really close that is). The audio includes a lot of that random beats with samples tossed in. If flight simulations are your thing, you'll probably appreciate Aerowings, but those looking for arcade action will absolutely deplore it.